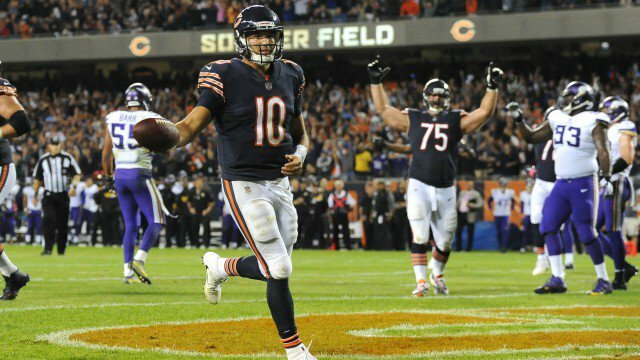 When the Chicago Bears decided to roll with rookie quarterback Mitchell Trubisky, they knew there would be growing pains. To minimize them, they knew they needed to up their game to help him out. They needed to play better defense, not drop passes, and protect him. To a degree, they did just that. But not enough to overcome a better game by Vikings quarterback Case Keenum. Sam Bradford made his return to the lineup Monday night, but he looked like he may have needed another week of practice to get his groove back. His timing was off as was his aim. He struggled to get a feel for the game and never looked comfortable.He looked a lot like the guy that used to play for the St. Louis Rams. Before he was pulled, Bradford completed just five of 11 passes for 36 yards and was sacked four times— once for a safety where he held the ball way too long for someone in his own end zone. Had Bradford stayed in the game, the outcome could have been different. It is hard to imagine he would have been able to get the offense moving with how he was playing. But Case Keenum replaced him, and the entire game changed. Keenum engineered a pair of touchdown drives to start the second half and take a 17-9 lead late in the third quarter. But then Bears fans got to see Trubisky’s potential in action. He responded to the Vikings score with a nice 11-play, 79-yard drive that took over six minutes, for a touchdown. The best part came at the end when the Bears ran a trick play for the two-point conversion. Trubisky took the pitch from tight end Zach Miller and ran it in. With the game tied at 17-17, it began to look like Trubisky might have a shot at winning his first start. Starting at the 10-yard line, he just had to drive the team into field goal range with 2:32 left to play. It was possible; improbably, but possible. However, it quickly became impossible when Trubisky threw an interception on the next play to Vikings safety Harrison Smith. “That was basically me trying to do too much, trying to make a play when I just need to know the situation — throw the ball away and play another down,” Trubisky said after the game (ESPN). Six plays later, Kai Forbath kicked a 26-yard field goal to win the game. Officially, Bradford reinjured his knee. 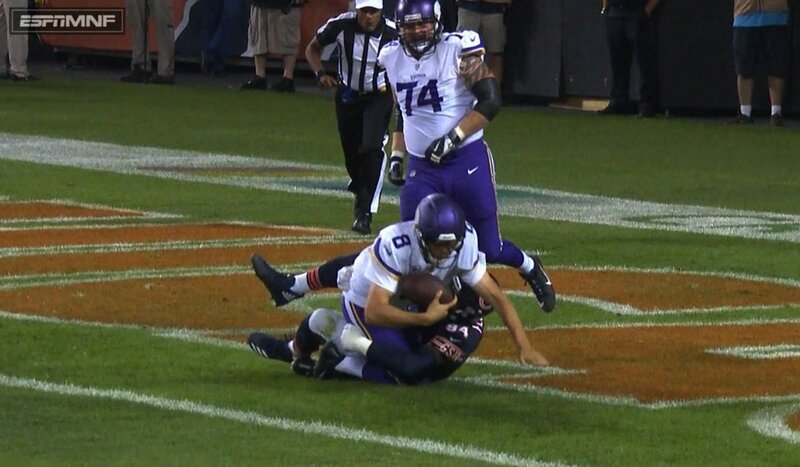 Considering how bad he looked and how easily it happened, chances are good Keenum is going to keep the job for a while. Latavius Murray didn’t look great in his first start since Dalvin Cook was injured. But Jerick McKinnon was able to provide a spark. Trubisky was far from perfect, but he was able to command the offense and extend plays with his athleticism in a way Mike Glennon couldn’t. Trubisky will get his first shot at a win on the road next week when the Bears travel to Baltimore. Minnesota will have a tough one on their hands with the Green Bay Packers coming to town.